The most attractive tripod turnstiles includes our unique "Hard-Point Mounting System" for field upgradeability. When you need to change electronic controls or counting systems you can make the changes without replacing the turnstiles. Thet Optical Stile family includes the same beautiful and uniquely rugged cabinet engineering as our tripod-turnstiles. Optical functionality includes various alarm levels and anti-piggy-backing. These Optical Turnstiles also include our new, highly customer-field-upgradeable, "Super Controller". The drop arm turnstile is designed to meet the spirit and the letter of the ADA regulations and the regulations of other nations. The Drop Arm Turnstile has one long passage barring arm or two mid-length arms. It has an array of cabinet mounted sensors and emitters. The sensor array provides a reasonably effective deterrent against multiple entries. One drop arm turnstiles can be installed in a bank or as the accessible entry/exit in a bank of turnstiles to allow ease of passage of those with physical challenges, strollers and delivery persons with carts. 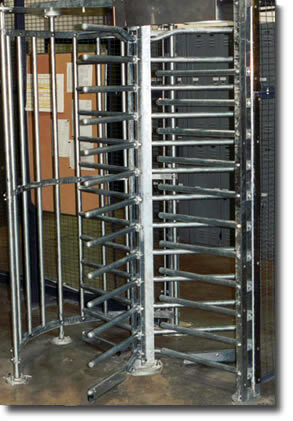 The Drop Arm Turnstile is available in a wide variety of cabinet shapes and materials. Full height Roto-Gates designed for indoor or out-of-doors use. All mechanical or electronically controlled. The unique construction and materials make our Roto-Gates the most durable in the worldwide industry. One-way three and four arm waist high turnstiles. These simple turnstiles keep people going in one direction and do not allow passage in the opposite direction. Automated and mechanical products allowing access for people in wheelchairs and children in strollers. Available as stand alone equipment or in housings to match turnstiles. We have developed the user-friendly ticket scanning turnstiles that can achieve self-service ticketing. Our field upgradeable turnstiles preserve your capital investment by eliminating the need for turnstile replacement despite future advancements in electronics. Mechanical coin operation, simple counting, ticket boxes.